Oakwood Hall is a another new venue for us, hoorar! We met Jo at one of the few wedding fairs we do every couple of years. Watching her walk round the room, I knew that she probably just needed a break when she got to me! So when she did, we chatted about general gubbins, took a picture or two, laughed and ate Haribo! Roll forward 18 months and we were somehow at the wedding day, time really does seem to fly. Where does it go? We arrived for Jo’s prep shots, and realised we were in for a busy day. Her mother’s cottage was full of people, laughter, decent cups of tea and croissants! Over with Chris, Double Windsor tie knots done, buttonholes in place, we were soon on our way to a beautiful church in the heart of Bingley, Bradford. With a wonderful Vicar who let us take pictures, Jo arrived in plenty of time – which is always a good sign! Ceremony time. 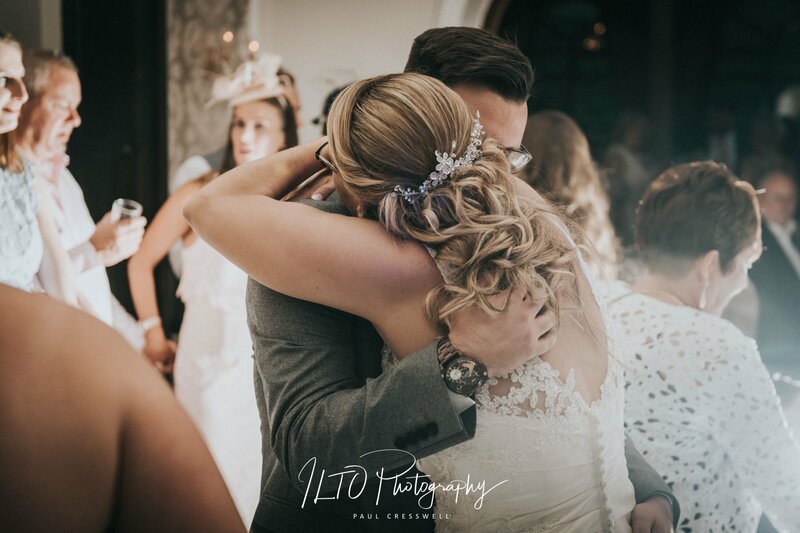 He did; she did; they did – the new Mr & Mrs Preston! Afternoon traffic dodged, we made it to Oakwood Hall before most of the guests, and Clare nipped inside to get the detail shots of the wedding breakfast room. Relaxed and informal formals done, as always, we stole the happy couple away to get a couple of shots, just of them, before they sat down to eat, and before we had time for a sit-down, we were laughing at the speeches. Time did it’s thing again, and before we’d blinked, we were smiling at the first dance pictures we’d got in the back of the camera, and were saying our goodbye’s.